← May 6 – 44 days to go. A beautiful day in the neighborhood. 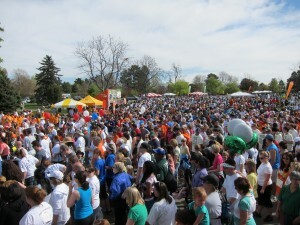 I went to the Denver edition of Walk MS this morning and met 6,000 brave and very optimistic people. Why so optimistic? Because we all believe that we’re very close not only to alleviating MS but to eliminating it. Over the past 50 years, we’ve made huge strides against infectious and auto-immune diseases. We’ve also wiped two of them — polio and smallpox — off the face of the earth. MS could be the next one. We’ve got it on the ropes and now we need that killer instinct to knock it out altogether. A lot of weird things happen during the end-game phase. Classical physicists, for instance, thought they had it all figured out in 1900 until Einstein popped relativity on them. The end game for MS may not play out quickly or cleanly but, if we keep our focus, it will play out. So let’s give the funds to deliver the knockout blow. Then we can turn our attention to whichever disease comes next. This entry was posted in Why I Ride. Bookmark the permalink.